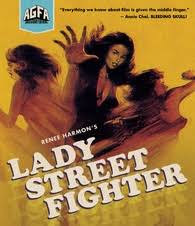 The American Genre Film Archive (AGFA) has announced that they are bringing Lady Streetfighter to blu-ray on August 14th. The film has received a brand new 2K restoration and comes bundled with it's unreleased sequel, Revenge of Lady Streetfighter. She makes the bad guys bleed! Written and produced by exploitation demigod Renee Harmon (Frozen Scream) and directed by the legendary James Bryan (Don't Go in the Woods), this is the story of Linda (Harmon), a tough-as-nails karate cop on the trail of the ruthless scumbags who murdered her twin sister! From the outrageous fight scenes to Harmon's incredible outfits, Lady Street Fighter is a joyous blast of no-holds-barred chaos from one of the most important lady filmmakers in genre history. Don't miss the special appearance by Trace Carradine, the most elusive Carradine brother of all!